Jared Ruiz Bybee is an attorney, social entrepreneur and professor. 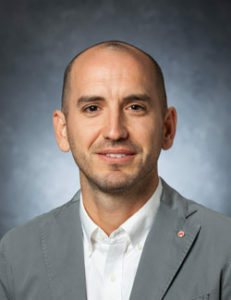 He serves as the director of the University of Georgia School of Law’s Economic Opportunity Clinic, which provides support to organizations that are working to remove impediments and facilitate access to economic opportunity for the poor. In addition to his law school role, he is a startup catalyst with the university’s Innovation Gateway - Startup Program, where he directs the NSF I-Corps Program to accelerate the commercialization of technology coming out of UGA. As the former director of the university’s Thinc. entrepreneurial program, Bybee developed and oversaw numerous programs to drive innovation, design thinking and problem-solving on campus and the greater Athens community. Previously, he was the director of operations for Paygo Ghana, a social enterprise focused on the distribution of solar powered lamps in West Africa as well as a Research Fellow at the New York University School of Law, where he focused on issues in real estate finance and U.S. housing policy. He also spent nearly four years in private practice as an associate specializing real estate and transactional work at Paul, Weiss, Rifkind, Wharton & Garrison. Bybee earned his bachelor’s and master’s degrees from Brigham Young University and his law degree from New York University. Active in the Athens community, Bybee currently serves as president of the Clarke County School District Board of Education.